Howie Marketing and Consulting, Inc. is a consulting firm providing grant writing, marketing communications and development support to nonprofit organizations in the lower Hudson Valley area. Founded in 1999, we have served dozens of clients helping them raise millions of dollars. Four of Howie Marketing and Consulting (HMC) clients won seven Westchester County Youth Bureau awards ranging from $30,000-$45,000 a year for three years. That's $855,000 secured for the YWCA White Plains & Central Westchester, Teatown Lake reservations, YMCA of Central & Northern Westchester and Lifting Up Westchester. Congratulations all! In four years, Howie Marketing and Consulting (HMC) has had eight Impact 100 Westchester quarterfinalists, four semifinalists and four finalists (Teatown Lake Reservation, Gilda's Club Westchester, Songcatchers and Westchester Exceptional Childrens School), each winning $12,000+. In 2016, Latino U College Access was awarded one of their $100,000 grand prizes. Congratulations all! 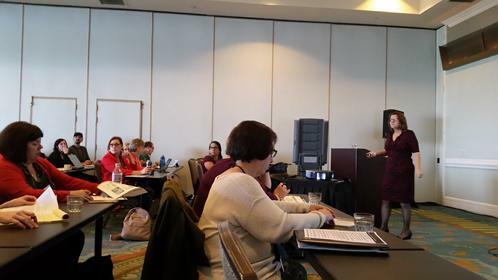 At the 2018 Grant Professonals Association's Conference in Chicago on November 9, 2018, Lydia spoke to a packed crowd on the Pet Peeves of Funders. She provided the audience of over 120 and 85 "streaming live" attendees the results of a survey done with dozens and dozens of funders about the "issues" they have with executive directors, development managers and grant writers. In 2017, Lydia spoke on Vetting for Success: Grant Seeking Skills, and in 2016, she spoke on Subcontracting: A to Z. See guest speaking tab under "Services" for more information.